In the first part of this series I looked at authorization in ASP.NET Core, but I only focused on controlling what pages/features the logged in user can access. In this article I’m going to cover how to control what data a user can see and change. By data I mean dynamic information that is stored in a database, such as your home address, what orders you made on an e-commerce site etc. Lots of web sites need to protect their, and your, data – it’s a hot topic now and you really don’t want to get it wrong. Part 1: A better way to handle authorization in ASP.NET Core. Part 2: Handling data authorization in ASP.NET Core and Entity Framework Core (this article). 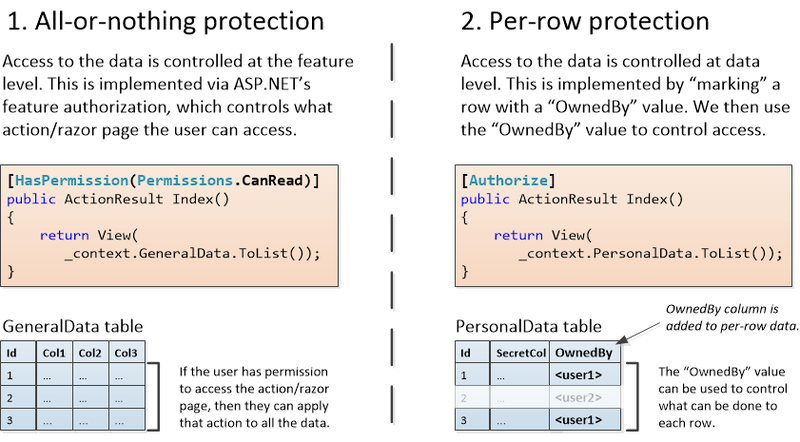 This article focuses on controlling access to data in an ASP.NET Core application using Entity Framework Core (EF Core) to access the database. I have extended the example ASP.NET Core application, I built for the first article and added a new ASP.NET Core MVC web app called DataAuthWebApp which covers data authorization instead of the feature authentication I have already described in Part 1. This is an open-source (MIT licence) you can look at to see how it works underneath. If you like this article then come to my talk on this (and part 1) at the NDC conference in Oslo in June 2019. The talk is called “A practical look at security and identity in ASP.NET Core and Entity Framework Core“. NOTE: you can Clone the GitHub repo and run locally – it uses in-memory databases so it will run anywhere and I seed it with test data. The application was written using ASP.NET Core 2.1 and EF Core 2.1: parts of the ASP.NET Identity is changing, but the overall concept will work with any version of ASP.NET Core. You can control what data a user sees by adding [Authorize(…] attributes to your controller actions or configuring razor pages, but it’s an all-or-nothing control – see the Part1 article for how to do this. If you want to filter the rows in a table, say only returning data associated to the current logged-in user, the you need a per-row data protection system – see this article on how to do that. The best way to implement per-row data protection is to put all the code inside EF Core’s DbContext. That way the protection is on be default to every class/table that you want protected. All queries for that entity class/table are filtered using a key provided from the user’s information. This article starts with the protection of personal data, then moves onto the handling grouped user access (known as multi-tenant systems) and finishes with the more complex hierarchical (e.g. manager->staff) system example. Static parts that is fixed by the code, e.g. how a page looks or the type of Web API it provides. Typically, you need to update your code and publish it to change the static parts. Dynamic data that can change, e.g. data held in a database or data obtained from external services. The all-or-nothing data protection is where the user can either access all of the data or can’t access it at all. In ASP.NET applications this is done by placing authorization controls on the controller actions or Razor Pages. This does allow separate control over different types of access to the data, for instance, we can allow a user to read all of the data, but not allow the same user to create, update or delete any of that data. Protection of personal data, e.g. e-commerce systems which hold personal data for its users. Applications where have hierarchical data needs, e.g. where a Manager-to-staff relationship exists and say staff can access one set of data, but the Manager can see all the data their staff can access. I add this as it covers the implementation of filtering data in different ways depending on the type of user, e.g. a manager or a staff user. The rest of this article is about applications that need per-row protection and how you might implement that with EF Core. A protect key in each row used to define who can access that data. The user needs to provide a corresponding key than can be compared with protect key in the row. The protect key I refer to in the list above about could be a unique value related to an individual user, a group of users, or some form of access key. This protect key is sometimes referred to as the user Id or the tenant Id, and in this article I also use the name “OwnedBy”. Typically, the “OwnedBy” protect key is held in the information about the currently logged-in user. In ASP.NET Core this is called the ClaimsPrincipal, and it contains a series of Claims (see this article for an introduction on Claims and ClaimsPrincipal). Below is a screenshot of the basic claims of a logged-in user called Staff@g1.com. As you can see the User has a nameidentifier claim, which a unique string for that user, often referred to as the UserId. In the diagram below I use the UserId as the protect key to select only the addresses in the UsersAddresses table that are link this this user. At the same time the UsersAddresses table has a corresponding protect key held in the “OwnedBy” property/column. This diagram shows the filter part of the per-row protection system: we get a protect key from the ClaimsPrincipal and use it to filter any read of the protected data. The key will vary, and the filter expression will vary, but the approach will be the same in all cases. The other part is how we add the protect key to an entity class/database table (what I call “marking an entity”), but that I will explain in the implementation section. Marking data with the per-row protect key. Filtering data using the user-provided protect key. There are a number of ways to do this, but I will be placing as much of the per-row protection code inside EF Core’s DbContext. This simplifies your own CRUD/business code, and more importantly it makes sure the per-row protection doesn’t get forgotten in the rush to get your code finished. What I describe below is the same for all per-row protection, but I use the example of protecting data linked to a user. I go into detail of each step in this process, but in later examples I assume you have read this section for the general approach. The first step is to “mark” each row with the correct protect key, which I refer to at the “OwnedBy” property, i.e. that row is “owned” by the given key. I want to automatically mark any new protected table rows with the correct protect key deep inside the application’s DbContext. I do this by creating an interface, IOwnedBy, (see below) which I apply to every entity class that needs row-level protection. That interface allows me to detect inside SaveChanges any newly created data that needs the OwnedBy” property filled in before saving to the database. Let’s look at parts of the code that do this, starting with the IOwnedBy interface. We also create a class called OwnedByBase that implements that interface and inherits that interface, which makes it easier to add the protection code to any entity classes (i.e. classes that are mapped to the database by EF Core). Here is a link to the PersonalData class in the example code that shows this in action. The next part is override the SaveChanges/SaveChangesAsync in the application’s DbContext. Here is SaveChanges version (Async version the same, but with async), so I have a common method called MarkCreatedItemAsOwnedBy which sets the “OwnedBy” property. Note the _userId on line 4. That is the UserId taken from the nameidentifier Claim – I show how you get that in the next section. The effect of all that is that the OwnedBy property is filled in with the current user’s UserId on any class that has the IOwnedBy interface. Ok, the first two parts are fairly basic, but getting the UserId into the DbContext is a bit more complex. 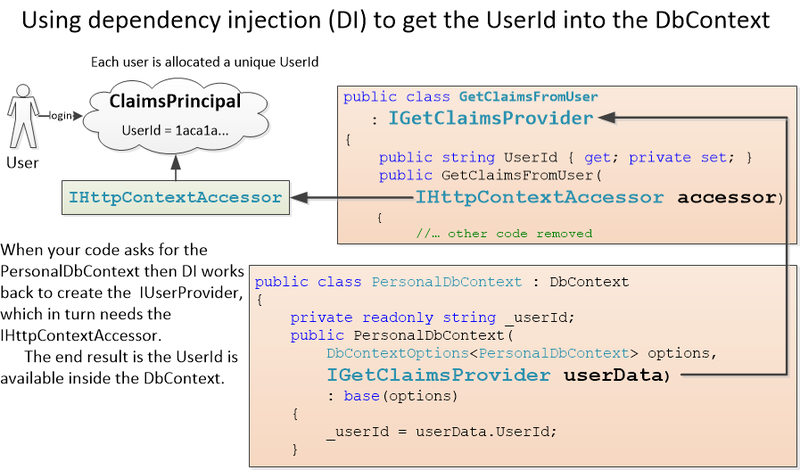 In ASP.NET Core its done by a series of dependency injection (DI) steps. This can be a bit hard to understand so here is a diagram of how it works. Here is the method extract the UserId from the current user’s Claims. There are lots of null handling because a) there will be no HttpContext on start, and b) the NameIdentifier Claim won’t be there if no one is logged in. This class is registered in DI in the ConfigureServices method inside the Startup class. That means when the application’s DbContext is created the UserIdFromClaims class is injected. NOTE: In this case I am injecting the UserId, which is found in the nameidentifier Claim. But you will see later that the same process will allow us to access any Claim in the User’s data. Here is constructor of the application’s DbContext showing the normal options parameter and the added IGetClaimsProvider data. The end result of all that is the application’s DbContext has access to the user’s id. Now that I have the per-row protected data marked with a protect key (in this case the UserId) I need to apply a filter to only allow users with the correct protect key to see that data. You could write your own code to restrict access to certain data, but with EF Core there is a much better approach – Global Query Filters (shortened to Query Filters in this article). 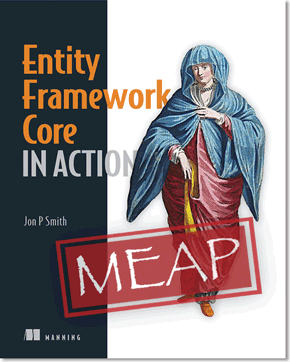 You can apply Query Filters to any entity class used by EF Core and they pre-filter every read of that entity class. Here is the code that sets this up for the entity class PersonalData in the application’s DbContext. In the UserId example that means a user can only retrieve the PersonalData entity classes that have their UserId, and that filtering is done inside the application’s DbContext so you can’t forget. NOTE: There is a way to remove any Query Filter from an entity class by adding the IgnoreQueryFilters method to any query. Obviously, you need to be careful where to do this as it removed your security, but it’s pretty clear what you are doing. The first example was dealing with personal data, which is useful but it’s a simple problem which could have written into your CRUD or business logic code. But when it comes more complex per-row protection problems, like multi-tenant systems, then all that code I just showed you is a much better solution to hand-coding data protection. When a new shop is signed up I need to create a unique protect key for that shop. An admin person needs to assign a user to a specific shop. I need to add the shop’s protect key (called ShopKey) as a claim in the logged-in user’s ClaimPrincipal. I need to add the per-row protection to all the entity classes/tables that are used by a shop. Let’s look at each of these stages in turn. When a new shop wants to join our inventory control application I need to add a new row to the Shops table. This might be done automatically via some signup system or via an admin person. In my example I use the primary key of the new Shop entity class as the protect key. Someone (or some service) needs to manage the users that can access a shop. One good approach is to make the person who signed up for the service an admin person, and they can register new users to their shop. There isn’t anything built in to ASP.NET Core’s authorization system to do this, so we need to add an extra class/table to match UserId’s to the shop key. Here is my MultiTenantUser class that holds the data protection information for each shop user. This is very simple: I use the UserId provided by ASP.NET Core as the primary key and then set the ShopKey to the admin person’s ShopKey. 3. Lookup the user’s ShopKey and add it as a claim in the logged-in user’s ClaimPrincipal. In the personal data example I used an existing claim, nameidentifier, in the ClaimsPrincipal as the protect key. In the multi-tenant example the big difference is I need to add a externally held protect key to the ClaimsPrincipal. NOTE: In my implementation I use cookie-base authentication, but I could have used JWT tokens, social logins etc. The approach I share will work with any of these, but the implementation of how you add a new claim to the ClaimsPrincipal will be different for each authentication type. //No ShopKey in the claims, so we need to add it. NOTE: In Part1 I give you a detailed description of the stages in the ValidateAsync method, but for authorization. However the steps are very similar so see “How do I turn the Roles into a Permissions Claim?” for a step-by-step breakdown of how the code works. This code is called for every HTTP request, but the first line quickly returns on all but the first request after a login. On first login the ShopKey claim isn’t in the ClaimsPrincipal so it has to look up the user in the MultiTenantUsers table to add that key to the ClaimsPrincipal. The last line of the code updates the ASP.NET Core authentication cookie content so we don’t have to do this again, which means it’s very quick once it has run once. This is the same process as I described in the first example of personal data, so I’m going to whiz through the code. First, I need an interface that every protected shop entity class has to have. In this example it’s called IShopKey, and here is it applied to the StockInfo entity class, with lines 7 to 11 implementing the IShopKey requirements. Then I need to extract the ShopKey claim so I can access it in the Shop application’s DbContext. Here is the variant of the GetClaimsProvider that does that. In this case I convert the claim value, which is a string, back into an integer as that is more efficient in the database. The query filters in the DbContext’s OnModelCreating method look like this. NOTE: You need to think hard about the query inside the Query Filters, as they are called on every database read of that emtity. Make sure they are as optimised as possible and add indexes to the protect key column in the database for in each protected entity class. MarkCreatedItemWithShopKey extension method which adds the ShopKey to any newly created Shop-related entity class (row). One of my clients needed multi-tenant system that handled the idea of a group manager, district managers etc. that can get data for reports from a series of shops. This means that the filter rules change depending on the how high the user is in the hierarchy. A user linked to a shop, say Dress4U, can only access the information about that shop. But district managers can access the group of shops, say Dress4U, Shirt4U and Tie4U, can see information for all the shops they manage. The MultiTenantUser class must change to tell us if the user is a shop worker or a district manager. When a user logs in I need to see if they are a district manager, and if they are I need to add a DistrictManagerId claim to the ClaimsPrincipal. The Shop and StockInfo need a reference to an (optional) district manager. The query filters now need to change depending on whether the current user is a shop-only user or a district manager. I’m not going to show you the code for all the steps in detail as this article is already very long. What I want to focus on is the Query Filters. In ASP.NET Core if you ask for an instance of the application’s DbContext, then a new one is created per HTTP request (a scoped lifetime). But, for performance reasons EF Core builds the configuration on first use and caches it. This means you can’t change Query Filters using an If-then-else command – instead you can use the ? : operators in the Query Filter’s LINQ expression. So, for the multi-tenant application with district manager support the OnModelCreating method looks like this. Note that the DistrictManagerId is injected into the DbContext using the same system and for the ShopKey. Have a look in the DataLayer for the multi-tenant entity classes and the multi-tenant DbContext. Another long article, but I have given you a lot of details on how to implement a per-row data protection system. As I said at the beginning feature authorisation (covered in Part1) is much more common than per-row data protection. But if you need per-row data protection then this article shows how you can implement it. I started with an example of using the user’s unique id to control access to personal data. That also introduced all the parts needed for per-row data protection. I then went onto two more complex per-row protection usages: a multi-tenant system and a hierarchical system. The hierarchical system is complex, but one of my clients needed that (and more! ), so it is used. Security is a very important topic, and one that can be tough to implement with no security loopholes. That is why my implementation places all of the per-row data protection is inside the application’s DbContext. That reduces duplication of code and makes sure per-row data protection is on by default. Personally, I also add unit tests that check I haven’t forgotten to add the query filters and any protection interfaces to the entity classes – you can never be too careful on security. Don’t forget to sign up to Jerrie Pelser’s, ASP.NET Weekly newsletter if you are interested in ASP.NET or Entity Framework. It is the most important newsletter I get.